Sober Look: Another call for an end to China driven industrial commodities "super-cycle"
Another call for an end to China driven industrial commodities "super-cycle"
Last time we discussed the views from Credit Suisse Research who believe that the tremendous growth in commodity demand we've seen in the past few years is not sustainable. Some of that view is coming from expectations that China will be undergoing a shift in sources of growth, focusing more on domestic demand rather than exports and infrastructure. This quote from CS drives the point home: "Getting a massage simply does not use as much steel as building an airport." Another research group, London based Capital Economics has now concluded that China driven commodities “super-cycle” may be coming to an end. Capital Economics: China’s demand has had such a big impact partly because the economy is large and has been growing rapidly, but mainly because the commodity intensity of that growth has been unusually high. As the economy rebalances away from commodity-intensive investment in the coming years, China’s demand for industrial metals is likely to fall well short of the levels currently priced into the markets. 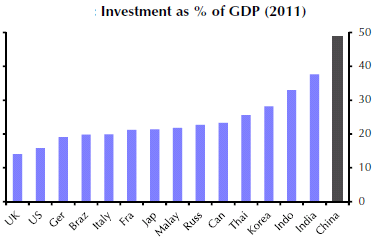 They argue that China's domestic investment has been extraordinary - close to 50% of the GDP. That is not sustainable as the nation gets closer to its goals of catching up with the developed world on infrastructure. China is also becoming constrained by the demographics of its labor force as the One-Child Policy is starting to take its toll. The infrastructure development and urbanization drive, supported by a seemingly unlimited supply of cheap labor, is slowing down. Going forward that does not bode well for further price increases in industrial commodities that we've seen recently. Capital Economics: This is a key factor behind our forecast that the copper price will fall to $5,000 per tonne over the next two years, well below current levels of around $8,400 and less than half the highs seen in early 2011.